Call me crazy, but I’ve been eating this frugal dish basically nonstop for the past few weeks. Maybe my body is telling me that I need vitamin C?? 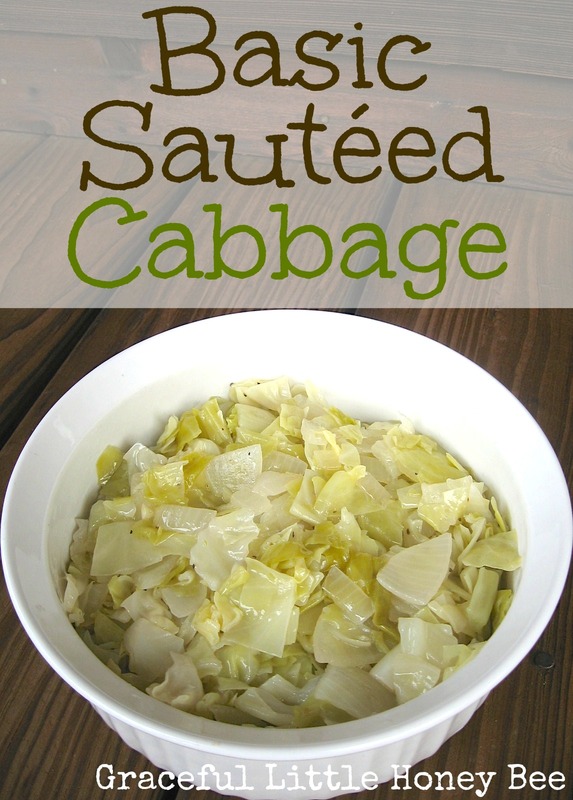 Anyway, I’m a huge cabbage fan and this is a simple, yet delicious way to prepare it. You could add sausage and potatoes to make it a whole meal. I’ve adapted the recipe from here. Step 1: Mix oil, vinegar, salt and pepper in large skillet or sauce pot. Step 2: Add cabbage and onions, sauté 5-7 minutes over medium heat. Step 3: Add broth and reduce heat to low. Step 4: Cover and simmer for 15 minutes. Mix oil, vinegar, salt and pepper in large skillet or sauce pot. Add cabbage and onions, sauté 5-7 minutes over medium heat. Add broth and reduce heat to low. I'm so glad your going to try this! I didn't know how many people would care about sautéed cabbage lol, but since I love it so much I thought I would share it. My whole family loves sauteed cabbage--even the little ones. I simply melt some butter in a pot/pan/whatever, throw in the cabbage with some salt and pepper, stir it around a bit, and cover it. If it gets too juicy, I just take the lid off. Yours looks like a yummy recipe, too! I LOVE cabbage, although the rest of the family is somewhat ambivalent. I planted two cabbages in the garden this year, and got six heads. We're swimming in cabbage! This is going on the menu for sure! So easy! I'm so glad you will be enjoying this recipe. I just ate it for lunch today. :) My family isn't so happy about eating cabbage either, but I love it. I've never had much luck growing cabbage because they always get eaten up with bugs, but I'm going to cover them with row cover next year. Enjoy! Goodness. Am I really that old (67)??? I've been cooking and eating like this all my life. When I was growing up, we had white beans and potatoes and cornbread at most meals. If we were fortunate, we had fried chicken after Sunday services. Sad comment that we need a blog to remind young people of these basics. Cabbage, olive oil, butter, white wine vinegar, balsamic vinegar, brown sugar. Everyone has different taste but I use around a Tbl of everything to the cabbage in a large skillet. Keep turning with tongs to your desired tenderness. Season with salt &papper to taste.